Samsung’s Galaxy Tab S2 isn’t new to the world but it sure is new to the UK, and Thursday’s London-based Samsung Unpacked event represented the stunning new tablet’s launch in the UK. We now know when it’ll be available for UK-based customers to get their hands on, and can bring you our hands-on review of the device after spending some time with it at the event. The Samsung Galaxy Tab S2 models are the successors to last year’s original Galaxy Tab S range, which featured the Galaxy Tab S 8.4 and the Galaxy Tab S 10.5. We thought they were the firm’s best ever tablets, so we had been looking forward to the arrival of the second generation. We’re pleased to say that, so far, they don’t disappoint. They’re thinner, lighter and more powerful, and it turns out we won’t be waiting much longer than our friends over in the US for them to go on sale. We’re in the process of adding our original photographs of the Tab S2 taken during our hands-on time with the tablet, so check back soon to see it in its full glory from every angle. The Samsung Galaxy Tab S2 is set to become available to buy in the UK on the 4th September, which coincides with the release of the new Samsung Galaxy S6 Edge+ (that’s a mouthful, isn’t it? ), which was shown off for the first time during the event. In the US they’re expected this month, so we’re pleased to say we haven’t got much longer to wait. We’ve yet to find out what the price of the new tablets will be in the UK, but we’ll update this article as soon as we find out as it could alter our overall verdict on these tablets. Their predecessors cost £399, £329, so we expect the prices for the new models to be similar. That would position them at the top of the tablet market, alongside the £399 iPad Air 2 and £319iPad mini 3. But if Samsung can bring these tablets to stores at a slightly lower price we think it’ll be tricky to recommend buying the iPad over this new entry to the market. 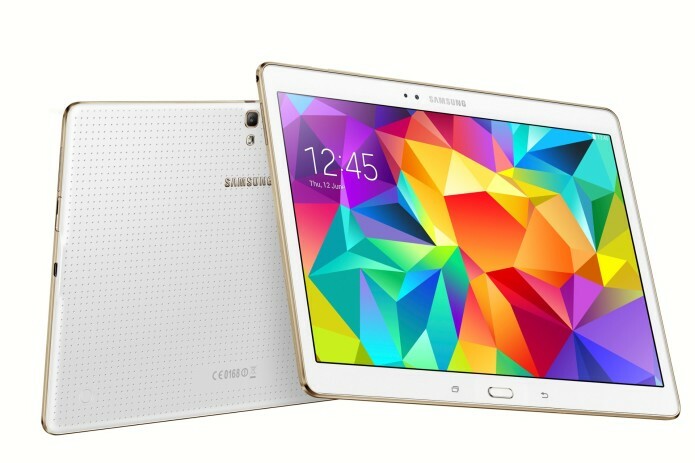 There are two sizes of the Galaxy Tab S 2 available, in a similar move to Apple’s iPad range. The smaller model is 8in while the larger flagship model is 9.7in. If you’re an Apple fan those sizes might sound familiar, as the iPad mini is 7.9in and the iPad Air is 9.7in. We’ll talk a bit more about the screens in a moment, but first let’s explore the design and build of the devices. Both were a delight to hold, and certainly felt on par with Apple’s iPad Air and iPad mini in terms of quality and comfort. They’re both an incredible 5.6mm thick, and weigh 265g (that’s the 8in model) and 389g (that’s the 9.7in). That’s a whole millimetre thinner than their predecessors, and is also thinner than the 6.1mm iPad Air 2 and even lighter. The Apple flagship weighs 48g more at 437g and you really can feel the difference. The iPad mini 3 is 7.5mm thick and weighs 331g, so there’s a big difference between Apple’s 8in tablet and Samsung’s new offering, too. We saw both white and black models of each size of the Tab S2 during the Unpacked event, but the only one we can currently see on Samsung’s website is a Gold model at the moment. But we expect that it will be available in all three of those colours, again similar to Apple’s iPad range which is available in Gold, Silver and Slate Grey. The back of the tablet is made with plastic, but it manages to look more premium thanks to the metal edges and completely glass front. The only quibble we do have is with the bigger of the two tablets, which has a bit too much bezel around the edges of the display for our liking. As mentioned, the screen sizes of the two Tab S models have decreased, a move that’s opposite to the way smartphones are heading where bigger seems to be better. With the decrease in size comes a decrease in pixels, as can be expected. Both have the same resolution, though, down from 2560×1600 to 2048×1536. Those displays are Super AMOLED, as can be expected from Samsung, and the company has said that they deliver 94 percent Adobe RGB. There’s also two display features to help it look even better: Adaptive Display, which can automatically adjust gamma, saturation and sharpness, and Reading Mode for the perfect brightness for your eyes. During our time with both tablets, we found the screens to be stunning. They’re bright and crisp and the colours seemed to pop, so we know they’ll make for a great experience if you plan on using your Tab S2 for watching videos and playing games. The two tablets share many of the same specs, despite being quite different in size. They have the same Exynos 5433 Octa-core processor and Mali T760MP6 for graphics, as well as 3GB RAM, so we expect it to do well in our benchmark tests and we’re looking forward to putting it head-to-head with its rivals and predecessors for our full review when we get one back to the PC Advisor labs. Internal storage is 32GB or 64GB and both have a microSD card slot to allow you to add up to 128GB more space, so you won’t be running out of room for more videos, photos or apps any time soon. When it comes to connectivity, you’ll find 802.11ac WiFi, Bluetooth 4.1, GNSS and optional 4G LTE, so essentially all of the connectivity features you’d expect from a flagship tablet these days which we’re pleased to see. You’ll also get the fingerprint sensor, which has been improved since the previous generation to match the Galaxy S6 phones, replacing the swipe requirement with a much easier-to-use touch mechanism like Apple’s Touch ID fingerprint sensor found on the latest iPads. The tablets do have different batteries, though, and that’s because of the different screen sizes which require different amounts of power to maintain. The smaller of the two tablets has a 4000mAh battery, while the 9.7in model has a bigger 5870mAh battery. We had a play with the cameras on the Tab S2 during the event and found that the pictures weren’t great, but we don’t think they need to be on a tablet so we aren’t too disappointed. The front-facing camera is 2.1Mp, while the rear-facing camera is 8Mp like the iPad Air 2. Pictures were a little grainy and shutter speed isn’t great, but you should find the images you’re able to capture satisfactory, and it’s more likely you’ll be using a smartphone or dedicated camera for anything important you want to take a photo of. The Tab S2 models come with Android Lollipop 5.0 pre-installed and we expect an Android M update is in the works, and as a bonus you’ll get Microsoft Office and 100GB of OneDrive free for two years with your tablet. Samsung has added some of its own features to the software, including the Pop-Up Window and Smart Manager features. We can’t give our final verdict until we’ve spent more time with the Samsung Galaxy Tab S2 models, but our first impressions have left us feeling excited about getting both models back to our labs to play with. It takes seconds to be impressed by these tablets. They’re almost unbelievably thin and light and that screen is a joy to use. We’ll be interested to see the price tags and are looking forward to running our benchmark tests to find out just how powerful these new tablets are, but we’re sure that these tablets are about to make their way into our best tablet charts, and they won’t come quietly.